I haven’t read a Frank Miller book that I didn’t love. He is true veteran of modern day comic’s mainly becuase all his works have managed to just mature with age. Something that only a few others like Alan Moore have managed to keep it real and stick to there guns when it comes to writing original long lasting comics. His latest work is a prequel to 300 called “Xerxes” named after the Persian God-King who lead the army against King Leonidas in 300. 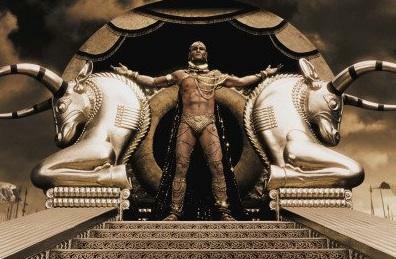 The new series will span 10 years of Xerxes rule a posed to the 3 days of his defeat. It will be written and illustrated by Frank Miller and published by Dark Horse Comics in a six issue series to lead up to the events in 300. The new story start with the Battle of Marathon will likely feature events of Xerxes assembling his million soldier army and explain his thirst for the following of a god. Read the original news at latimes.